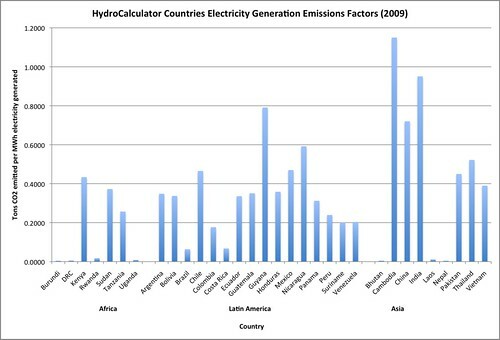 Here are a pair of charts comparing emissions factors across all countries currently installed in the HydroCalculator for the most current year on which full information could be found, 2009. 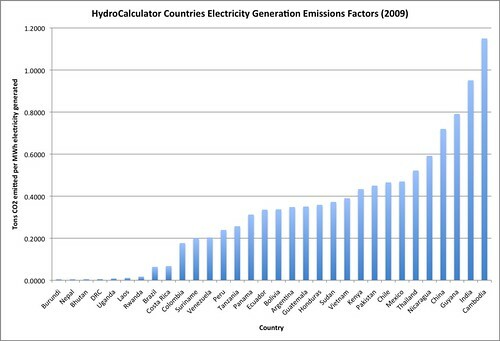 A country's emissions factor is the amount of carbon emitted for each megawatt-hour of electricity generated (TCO2e/MWh). Please note that these factors only take into account variable emissions. That is, they do not factor in any emissions caused by the construction of power plants, only those caused by day-to-day operation. GHG emissions caused by rotting vegetation from flooding an area for hydropower are factored into a separate part of the model to allow for greater regional accuracy. For more information on this, see the help article Vegetation Types and Biomass.